By the time October rolls around, I’ve got my freezer well-stocked with homemade pie crust and my compilation of pie recipes at the ready. And out of all the pies I make, lemon meringue pie has got the be my favorite. It’s tart lemon curd filling topped with fluffy, sweet meringue create a lovely blend of intense flavors. And if you’ve got a flaky, buttery crust underneath all that, it’s the ultimate dessert. While it’s really easy to make a delicious and beautiful lemon meringue pie, there are two common mistakes that should be avoided. Over-boiling the lemon curd: If you boil the lemon curd for too long, the cornstarch will lose its ability to thicken, leaving you with an overly-runny lemon curd. To avoid boiling the curd for too long, get all of the ingredients out before you start. Not spreading the meringue to the edges: If you don’t seal the pie with meringue, the meringue will shrink on top of the pie. This results in a not-so-pretty lemon meringue pie. To avoid this, simply spread the meringue to the crust to seal it. 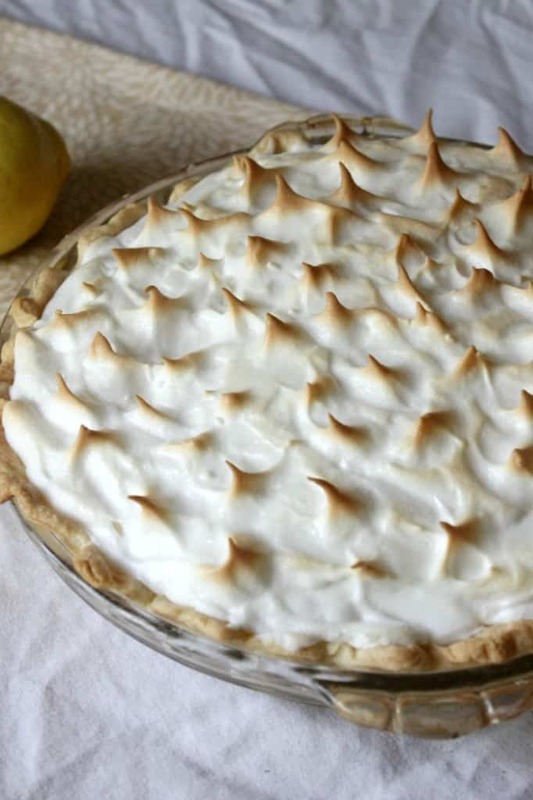 As long as you seal the pie with the meringue topping and remember to not over-boil the lemon curd, you will get a perfectly elegant and delicious lemon meringue pie every time. 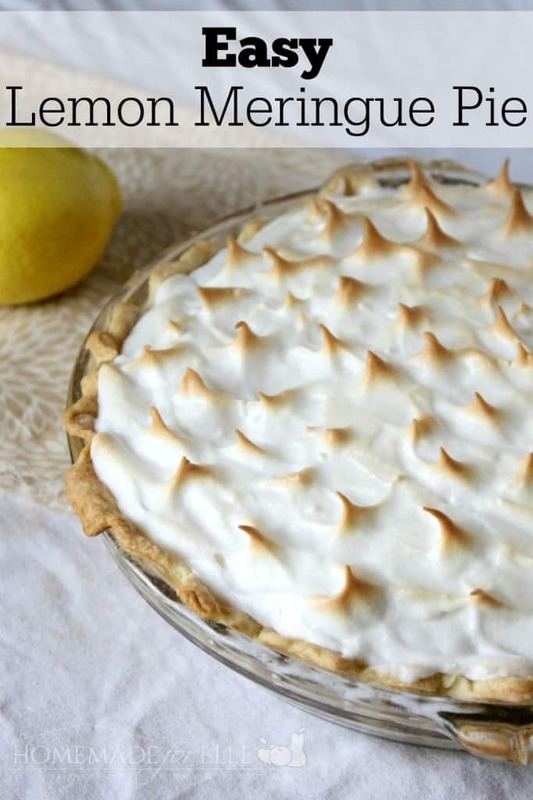 You’re going to love this easy lemon meringue pie! I’ve tried multiple recipes, but this is the best I’ve ever had. It’s so easy and you can’t beat the taste. Roll the pie crust into 10-inch circle on a floured surface. Transfer it to 9-inch pie pan and crimp the edges. Cover the crust with foil and pour pie weights or dry beans on top. Bake for 15 minutes. Remove the foil with weights/beans and bake for another 10 minutes, or until crust is golden brown. Meringue: In a small bowl, whisk together sugar and cornstarch. In a large mixing bowl with whisk attachment, beat egg whites until foamy. Then slowly add sugar mixture one tablespoon at a time and continue to beat on medium high speed until stiff peaks form. Set aside. Filling: In a medium saucepan, mix together water, lemon juice, sugar, cornstarch, flour, lemon zest and salt. Bring the mixture to a boil over medium heat, stirring constantly. To temper egg yolks, add about half cup of lemon curd mixture into the egg yolks and stir vigorously. Return the egg mixture back to the saucepan. Continue cooking for 3-5 minutes, continuously stirring. Throw in the butter. While butter is melting in the filling, briefly whisk the egg whites for a minute. Transfer the hot filling into pre-baked pie crust and immediately spread the meringue over the filling making sure to seal the edges. 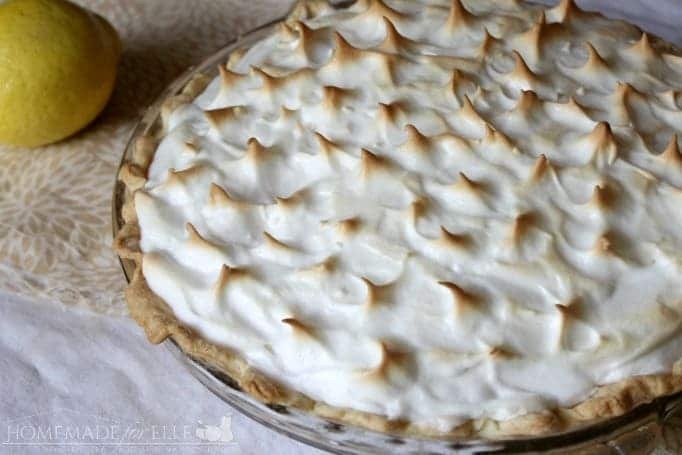 Bake the pie for 8-10 minutes, or until meringue is golden brown.